As part of a modernisation process NADFAS is working on a restructuring process for societies. National Trustee Hilary Alcock, who was also our first Chairman, has suggested that Fylde DFAS should be a pilot, keeping a diary and reporting on our progress and problems as we go along. A document explaining the pilot is available here. The Committee has agreed to participate in this pilot study and restructure itself using a model currently being formulated and under discussion amongst the NADFAS National Working Group but which is customised to Fylde DFAS. The structure of Fylde DFAS will comprise an Executive Committee and a number of Teams. The Executive will be responsible for governance and strategic planning. The Executives will be Chair, Vice Chair, Secretary, Treasurer, Membership Secretary and Programme Secretary. To begin with Team leaders will come from the current Committee; each will be responsible for operational management and future planning of of the areas within their remit. 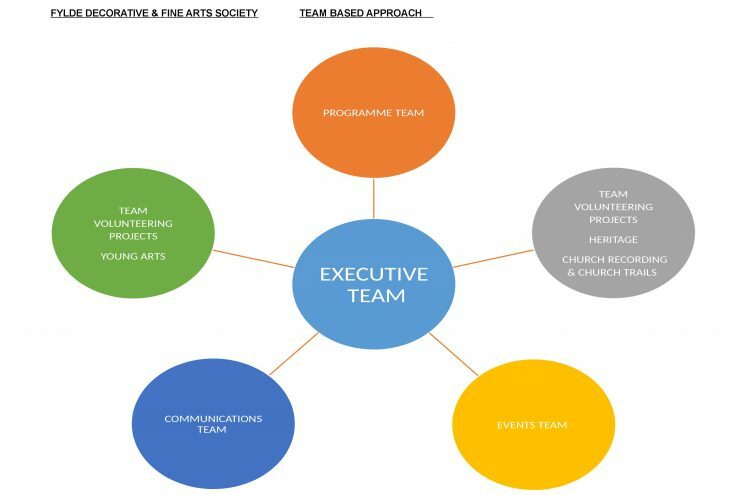 There will be five teams: Programme; Events; Volunteering Projects: Young Arts; Volunteering Projects: Heritage & Church Recording/Trails; and Communications (please see Diagram). It is believed that the new structure will widen out the organisation and make it easier for members to be more involved by dipping in and out tasks without the obligations of a full Committee role. The new structure will be implemented autumn 2016.